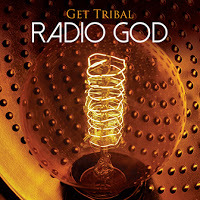 Get Tribal is a group that pays tribute to ancient rhythms and spirituality on their recording Radio God. The goal is to awaken the Chakras and indeed it does. Each track is named with four radio call letters inspired by regional or religious iconography. Radio God is due out on October 6th 2015. Kari Hohne is the artist that drives this new project. As stated in their press - Radio God is a surreal revival of world spiritual music arranged with ethnic rhythms, modern beats and infused with radio/media nostalgia. This recording is a follow up to the acclaimed album God of Drum. Kari started composing music at the tender age of 6 so it is no wonder that she has advanced into so many segments of music and spirituality. She is a diverse and talented artisan with boundless energy without limitations. The music on Get Tribal is a direct reflection of that eclectic approach. “GUIP Sunrise” opens up the album with gentle stirrings of life just as we experience on a daily basis. The combination of tribal rhythms and electronics make for an inviting sequence of events that unfold before you and then continue to advance with each track. “RUAH: Breathe” steps up the pace with more earthy tones and atmospheres with the drums providing the heartbeat that pumps the musical blood of the track as it builds and transforms. At this point I am becoming more and more intrigued with this music wondering what is going to come next. “TABA: Out of the Underworld” creates an anticipatory and movie like soundscape for the listener. It excites and energizes then takes it all down a notch and relaxes within the same composition. Soft keyboards enter the scenery and it makes you feel like you are floating along on a wafting cloud. You feel like this should not end as it feels so natural and good for the spirit. “KVED: At One in the World” is the album closer and perhaps the most prolific track that personifies this recording. It was featured on one of our sister sites Rate The Tracks. It starts off with a gentle invitation of an acoustic guitar closely followed by ever present drums to drive it along as different instruments gradually added create a world instrumental simmering kettle that comes to a full boil literally overflowing with good vibrations and spiritual awakenings. It gets injected with a shot modernization then some strong electronic essences via the synthesizer at different points. This kind of mix is what makes not only this track but the entire recording a true musical adventure.